According to legend, Zoroastrians arrived by boat on India’s west coast between the 8th and 10th centuries, fleeing religious persecution in Persia. They found refuge, quickly integrating with the local population by adopting the Gujarati language and local customs, while steadfastly hanging onto their religious beliefs. 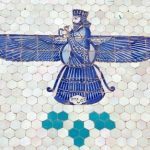 That first wave became known as Parsis; a second wave, arriving in the 19th century, became another subset called Iranis.